Bourse metro station - which welcomes two million passengers per year - has gone through such a metamorphosis that it is unrecognisable. 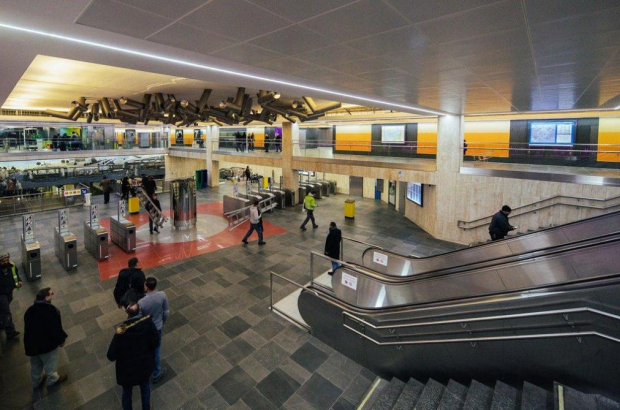 With a budget of €15 million and more than two years of construction, the station is light-filled with a generous use of LED - which combines low energy consumption with versatility since the lights can change colors to celebrate different events, as well as a heightened sense of security. The two major art pieces of the station, Moving Ceiling by Pol Bury (1976) and Nos vieux trams bruxellois by Paul Delvaux (1978) have been completely restored and a combination of marble, granite, ceramic tile, laminated sheet metal, stainless steel and glass have been used throughout the station to create a warm but clean look. Some 79 CCTV cameras and new toilet facilities which self-clean after each use add to the security. There are new artworks - and the southern end of the station has become a cultural space called Quartier. Different curators will follow one another with shows. The first, curated by Mangoo Pickle, is entitled Passers-by and includes photography, illustration and audio, animated illustration and painting. The ceiling of Quartier is made up of lights which take the shape of various constellations as seen from Earth. All levels of the station are easily reached by people with reduced mobility. There are now eight entrances and a large lift which can accommodate cargo bikes which are rapidly gaining in popularity. Bicycles have a place of honour in the station with a bike repair shop, a bike wash and three types of storage: 194 parking slots with free access, 18 spots for cargo bikes and 610 secured bike parking slots. Yearly bike parking passes are €30 but if bought before the end of June are only €15.